The celebration of Christmas in Mexico goes back to Colonial times and the influence of Catholicism. In their quest to teach the new religion to the indigenous peoples, the Spanish missionaries made use of the existing traditions. During Winter Solstice (December 21) the Aztecs worshipped the birth Huitzilopochtli, of one of their two main deities, god of the sun and war. After Huitzilopochtli had traveled through the celestial vault, he returned to Mictlán (the place for the dead) as a hummingbird. These celebrations began early December in all homes; guests were invited over to share food, “alegrías” (amaranth candy), and given presents of small idols made of corn and honey. The sun was reborn on December 24, and the rebirth was celebrated with rituals and dances. The transition into the catholic religion did not take long, as only a few years after the arrival of the Spaniards, Joseph’s and Virgin Mary’s pilgrimage to Bethlehem seeking shelter for the birth of Baby Jesus was recreated and carols written and sung. These representations gave origin to the Posadas, a unique Mexican tradition that, back then and still today, the Posadas take place from December 16 to the 24. Although initially consisting of processions in church courtyards while parishioners sang litanies and carried Joseph’s and Mary’s images, nowadays Posadas are typically celebrated along friends and family, still preserving the roots. Friends and family split into two groups, each group sings different verses of a litany while one plays the part of Joseph and Mary asking for Posada (shelter) and the other, the part of the innkeepers, sometimes even knocking at neighbors’ homes. Following the representation, comes the piñata. Imported from China, it was used by the friars as an instrument to teach the natives about the seven capital sins portrayed by the piñata’s peaks or spikes; every blow symbolized beating down the sins/evil. The reward was and is in the form of assorted candy, fruit and toys after the colorful piñata breaks. All this is followed by dinner and many times include the typical ponche, a warm fruit punch sometimes spiked with brandy or rum or tequila. Many of you living in Cozumel may wonder about the children knocking at your doors in December, carrying peculiarly decorated branches and asking if they can sing La Rama (‘the branch’) for you. Another age-old custom from Colonial times originated in the State of Veracruz and expanded to the States of Tabasco, Chiapas, Yucatan and Quintana Roo. With their ornamented branches, children sing for you -oftentimes off-key- expecting to receive a few coins at the end which will be used for their own Posada. Nowadays, most of these States hold contests for the most original Rama. 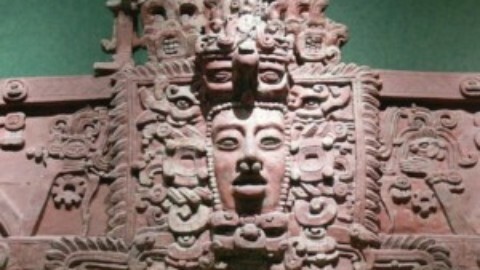 The Aztecs and Maya made dramatic performances of hunts, men dressed up as animals, etc. and the Spanish missionaries made use of these histrionic skills to stage the Pastorelas as a means of evangelization. The word derives from the Italian pastorella, meaning shepherd girl. The play-acting included Joseph and Mary’s pilgrimage and the humorous adventures of shepherds dodging obstacles to arrive on time for Baby Jesus’ birth. Pastorelas, illustrating the perennial fight between good and evil and a combination of divine and human characters, are still staged but have been modified; even if they still preserve their originality, they are a bit more sarcastic as, for instance one of the main characters, the devil, is compared with current politicians, ridiculed and defeated by other characters. In the end, the intention is to represent justice, miracles and promises of salvation which this season brings. Among this season’s traditions in Mexican Catholic homes are the mangers, whether in small size or even life-size figurines, these portray the birth of Baby Jesus and the Holy Family; some are real works of art as they recreate villages, lakes, homes, a depiction of the everyday life in Bethlehem of the past. Traditionally, the mangers remain until after January 6, the Three Kings Day/Epiphany although some until February 2, the Day of the Virgin of Candelaria. After the Posadas, which end at 11:30 pm on December 24, comes Nochebuena or Noche Buena (literally the ‘Good Night’ – Christmas Eve). This is a very special time when families get together at home for the birth of Baby Jesus. Before dinner, while some attend midnight mass, at home after the bells toll 12 times, standing before the manger each member cradles Baby Jesus making a silent or audible petition and the Baby is finally placed for the first time, at home, in the crib at the manger. Then the hugs, good wishes, maybe a few presents and a scrumptious late dinner. One of the legacies from Mexico’s ancient culinary past is the guajolote (turkey), native of Mexico, included by the Spanish Conquistadors into their diet as a delicacy. The Nochebuena dinner is a major event; a compilation of tastes and seasonings influenced by many cultures, still preserving Mexico’s original flavors, adapted to each region: the turkey, the romeritos (which resemble rosemary) served with patties of shrimp, potatoes in mole sauce; the bacalao (dried salted codfish) stewed with tomatoes, capers, olives, and potatoes; pozole, tamales, buñuelos (sweet fritters), ponche….and many other exquisite dishes and combinations! !For the Catholic Church December 25 is the day to remember Christ’s birth. Time has passed, but the ancestral sprit lives on in a beautiful gift that Mexico gave the world, one of the most emblematic Christmas symbols: the poinsettias or Flor de Nochebuena (Christmas Eve Flower). Long before Christendom arrived to Mexico, the Aztecs cultivated the Cuetlaxochitl and was used by the missionaries to decorate mangers. Its name in English is in memory of Joel R. Poinsett, appointed the first American Minister to Mexico in 1825, who sent samples of the plant to the US. On December 24, 1899 the Cuetlaxochitl first adorned the Vatican’s Saint Peter’s Basilica. World traditions and religions may be different, but no matter how you celebrate flow with this season’s magic, goodwill, hope, sharing, joy, peace and love and hold them in your hearts all year long. Feliz Navidad!!!! Monica Sauza, a court certified translator, has been assisting island residents with translations abd immigration issues for over a decade.